Robot Rex was a former robotic creation of Rex Dexter that was reprogrammed by Emperor Kurr into his loyal servant. 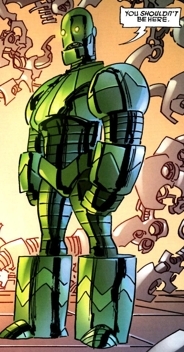 When Rex was banished to Dimension-X along with his family, Kurr had Robot Rex pose as the scientist by rebuilding him into the spare Battle Tank armor. Despite getting verbally abused frequently, Robot Rex remained incredibly loyal to its creator and master until Kurr’s eventual death at the hands of Dragon. With Kurr’s death, Robot Rex attempted to make amends for the actions performed under his late master’s commands. He worked inside his creator’s laboratory and assisted Malcolm Dragon and Battle Girl as they struggled to deal with the void left by their father’s death. The young heroes made suggestions that perhaps Robot Rex and his fellow robots should travel into Dimension-X to rescue their missing creator, Rex Dexter. This posse robots went into Dimension-X for this rescue mission and all were destroyed by various threats as Robot Rex fought to protect Rex and his family. When the group could not open a portal back to Earth, Robot Rex opted to sacrifice his life to cover the escape of his creator. Rex was covered long enough to fly Horridus and Dixie Dexter to Glum World so that Mister Glum could finally send them home.